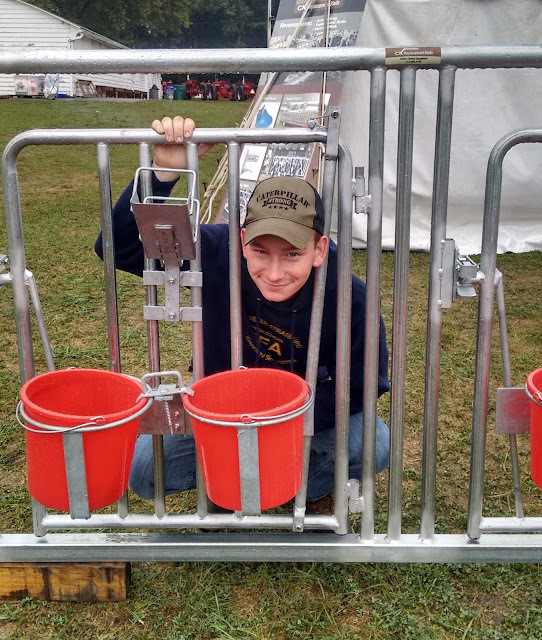 The 92nd West Lampeter Fair might have officially opened last Wednesday. But for the Garden Spot FFA, it started ten days earlier with fair setup. The FFA has helped setup for the fair for years. This year the group had around 20 students helpers for a combined total of over 70 hours of community service. Members of the Garden Spot FFA learning to do, doing to learn, earning to live, and living to serve. In addition to the setup even began, many people dropped off exhibits the day before the fair on Tuesday September 27. Twenty Garden Spot FFA members submitted entries ranging from pictures to potatoes. Garden Spot FFA: Entered two tractors (John Deere B, Farmall H) - Bryce Good and Pierce Lehman drove them in the Tractor Parade. On Thursday of the fair the upperclassmen and FFA members take a field trip in order to judge animals and interact with the other chapters. This year Lancaster County Career & Technology Center, Penn Manor, and Lancaster Mennonite came and competed in judging ten classes of animals, crops, and vegetables with prizes of t-shirts and fair food. In the afternoon the FFA did competition events such as log saw, corn shucking, and tug-a-war (which our guys brought home the plaque in). Friday, the underclassman took their trip and did most of the same activities with Penn Manor, however, their judging was focused more on learning and less on judging for prizes. Since the weather was nicer day they were able to compete in bale toss, as well as log saw, tug-a-war, and corn shucking. This year for the FFA food stand the business was slower than other years but shift signups were not. We had over 30 members and multiple alumni help in our stand over the course of the week. On Saturday morning when the fair was over and most people get to slept in, the Garden Spot FFA was back at 7:30 a.m. to help with fair cleanup. Throughout the week we also had members help pick up trash and empty the trash cans. We had ten students work more than 30 hours on Saturday morning. Also, after cleanup we had our tractor driving practice at the fairgrounds where students practiced backing wagons and driving a set course. Jared Risser placed first in the junior divison in the Safe Tractor Driving CDE. The Tractor Driving contest was held on Tuesday October 4 where we had three students compete. Kyle Spotts placed 4th in the Senior division. In the Junior division Jared Risser placed 1st and Pierce Lehman placed 3rd. Kyle Spotts pauses for a photo while working at the fair. The FFA would like to thank those who bought an animal from a Garden Spot FFA member. Jordan Martin sold his big beef to In Memory of Bud Dean (Atalie Winters) for $2800. He sold his hogs to Hess Mills for $700 and to Stoltzfus Meats for $900. Jared Risser sold his hogs to AI Products for $1250 and to Star Rock Farms for $900. Jess Herr sold her lambs to the McMichael Family for $1000 and to Wolgemuth for $800. Leah Welk sold her pigs to Weaver Insurance for $1000 and to Norma Weaver for $800. She sold her goats to Stoltzfus Meats for $2500 and to Stonehurst farms for $1150. Bryce Good sold his dairy beef to R&J consulting for $1700. Roddie Rice sold his goat to Friends of Garden Spot FFA for $1500. Ben Welk sold his pig to Steepside Farms for $1000. Donovan Weaver sold his lambs to Country Star Farms and Morrisey Insurance for $800 each. Luke Stauffer sold his lambs to A&I Products for and to Weaver Turf Power for $600 and $700. Grace Hess sold her lambs to Friends of Garden Spot FFA for $850 and $875. Sarah Hess sold her pigs to Herr & Leaman Farm Equipment as well as one to Denlinger and Fisher for $900 and $950. Connor Ranck sold to his goats to eve’s gardens for $550 and Brenneman’s for $650 and his dairy beef to Dale Hershey for $1000.